From Internationally Renowned Psychologist and Author Glenn Livingston, Ph.D.
"Why Continue to Struggle Alone When I Can Personally Help You to Defeat Your Worst Cravings, Lose Weight, and Stick to the Food Plan of YOUR Choice?" Over the Next Five Months Let's Cage Your Pig and Make Sticking to Your Food Plan as Easy As Breathing... Even at Night, on Weekends, and When Your Emotions Are Out of Control! Then we'll follow up with UNLIMITED ONE-ON-ONE COACHING for four months (again with me personally) to address all your personal questions and maximize the odds of your program STICKING for good! Yes, you read that right. Unlimited. Keep reading below for the full details please...including the 100% money back guarantee if you don't dramatically change your eating habits by the time we're done! With this powerful combination of an online MONTH LONG LIVE GROUP IMMERSION to kick start your progress AND FOUR FULL MONTHS OF UNLIMITED ONE-ON-ONE COACHING FOLLOW UP you can succeed regardless of how much social pressure and/or family conflict you experience...no matter how much you travel and/or eat out...and despite how little free time you may have available to prepare and/or plan your food! "I have managed to lose 74 pounds and have not binged one single time"
"My life has totally changed. My weight dropped 17 pounds and it's very clear what my body needs and wants. As long as I stick with my plan I keep losing 3 or 4 pounds per month [...] Many of my doctor friends are in trouble with obesity [...] I think doctors need help and would be interested in Never Binge Again not only for themselves but their patients!" DISCLOSURE: It would be unreasonable to assume you'll get the same results as many of the clients on this page, who may be considered outliers, because of their unique situations, metabolisms, and backgrounds. Then again, it can and does happen! And with the new pricing options, wouldn't you be risking more by not joining me? Hear me out please before you make up your mind, because it could very literally change your life! If you've read "Never Binge Again," you know I went to great lengths to ensure it has everything you need to stop overeating. But as good as it is, not everyone stops with the book alone. A lot of people get stuck half way. They get a tiny glimpse of the freedom Never Binge Again can provide, and they really believe it CAN work but they still can't quite commit or make it work for them. This can be VERY frustrating. And I'm NOT going to suggest you "hug your inner wounded child" while offering no practical wisdom to help you with your binge eating! So I can personally drive the Never Binge Again benefits home for you, and help you live the life you KNOW you're capable of inside. LIVE perspective from someone like me is often the missing ingredient. It'd be a shame for you to give Never Binge Again "a quick try," only to slip back to your old ways because your Pig™ has convinced you it works for others, but it can't ever work for you. Or because you're perpetually putting it off to start "someday." We both know "Someday" is NOT a day that shows up on ANY calendar! "A powerful, thought provoking, and very un-ladylike approach to the problem of bingeing!" Squelch That Awful "I Can't" Voice in the Back of Your Mind! The Personal Contact You'll Get From Me in the LIVE Online Group Immersion Program AND The One-On-One Coaching with ME...Can Literally Change Your Life! In my experience there's nothing quite like personal contact, connection with others who have similar struggles, and the ability to work LIVE in the real moment, to give you 100% confidence you CAN stop bingeing and overeating (and put the Pig in its place.) Plus, it's a LOT less complicated than most people have been led to believe. And if you'll give me your attention for just one month of group sessions and four months of unlimited individual follow up coaching, I can quite literally give you your life back. I know that's a BIG promise and I don't make it lightly. So! 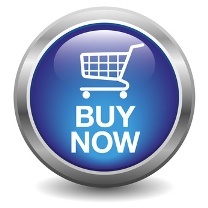 If you've been looking for a way to get affordable direct contact and guidance from ME personally, please take a few moments to read through this page. I racked my brain to come up with a way to provide coaching support to the maximum number of people while maintaining the level of individual attention required to be effective. 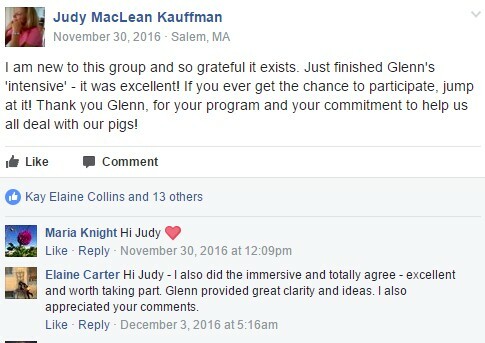 It All Starts with a LIVE Online Group Immersion Program: I've worked with a LOT of coaching clients since publishing the book. A lot of the time spent in the first few sessions is to get them over a dozen or so very common stumbling blocks. This can require a few full length sessions, which is very expensive for most people. Allow at least four days between appointments so you'll have time to live with the changes. Use the automated scheduling link, which provides a wide range of options to fit every time zone, work schedule, etc. You'll schedule one session at a time as needed, and will avoid "short notice changes" (cancellations and/or no-shows with less than 48 hours notice.) We know life is unpredictable...so we allow for one short notice change per client at NO charge. Thereafter, a non-refundable $35 fee applies to each incident. There is NEVER a charge for sessions changed with 48+ hours notice. Last thing - in order to maintain my ability to provide quality attention, I have to limit the unlimited coaching offers to the first fifty people to order each coaching package for the event. NEW: We've now also added access to ME personally in a live, weekly Q&A group for one full year at NO additional charge. That way you're never more than a week away from talking to ME personally to get help with ANY stumbling block you encounter for one full year. This weekly Q&A group starts simultaneously with the one on one coaching above. 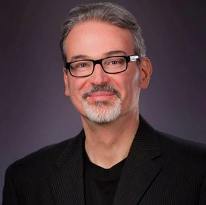 While both the Q&A group and the initial four group sessions are taught by Dr. Glenn Livingston personally (that's me! ), the initial four sessions are approximately 80% presentation content and 20% group coaching while the year long Q&A session is entirely dedicated to answering questions and coaching participants in a group format. 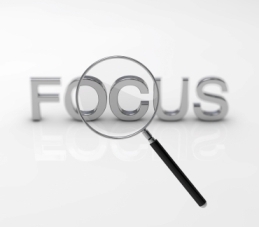 The whole reason people pay for private coaching is to get well deserved, FOCUSED ATTENTION. Through experimentation and study, I've found the best way to provide this is with a laser focused and thorough response to your personal questions, AFTER having immersed you in the basics and gotten YOU to focus your attention on homework related to a very specific problem. The unlimited calls combined with the focused assignments in between to help organize your thoughts, stop overeating, and reprogram yourself to think like a permanently thin person on the diet of your choice. And the structured, short follow ups give you the support and help you need WITHOUT training you to become dependent on a coach forever! In the end, it's the most workable coaching model for implementing Never Binge Again. I'm not your run of the mill "diet guru." I've got an extraordinarily well thought out SYSTEM for stopping overeating and binge eating in its tracks, and for restoring your sense of ownership, responsibility, and power over your own food. 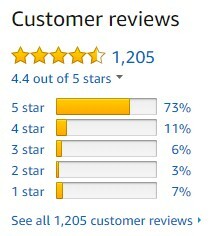 I know a lot of people SAY they've got a system but my book has more than 1,200 Amazon reviews and has appeared in the top three for "Binge Eating" and "Overeating" for months at a time for a reason. It works! I've got a very full and balanced nutritional and health regimen which fits MY needs perfectly. I'd like to help you achieve the same! I'm not just talking about having a positive attitude and a sense of humor, which of course I DO have (despite what my Mom said,) but a forward moving, passionate zeal for life based on a REALISTIC ability to define and comply with my Food Plan. My body is rarely at war with food, so I've got an incredible amount of energy to connect with others and achieve amazing things. Not miraculous things—I claim no divine connections worth speaking of—but amazing things via the application of Never Binge Again skills with persistently focused attention. 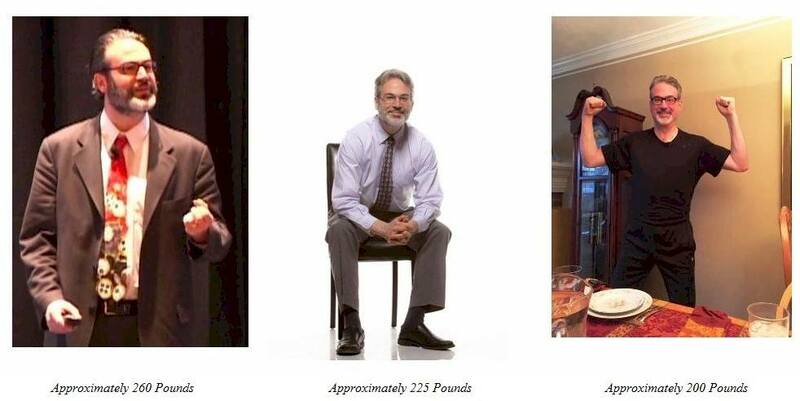 Famous health and weight loss authors—who compete directly with Never Binge Again!—endorse both the method AND Dr. Glenn Livingston himself as the their 'go to guy' when they have trouble with their own eating! 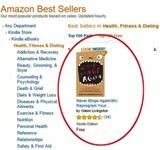 Finally, there are SO many happy customers raving about the book and/or their Never Binge Again coaching experience! Nancy didn't focus on losing weight immediately. night. After a while, just because she didn't binge and was eating healthier, the weight started coming off. Now that you know what you need to know about the UNLIMITED COACHING (which starts AFTER the four week online immersion sessions)... let's talk about the Online Immersion Program itself! The Never Binge Again Online Intensive Consists of 4 x Two-Hour Live Online Sessions, Each of Which Builds on the Previous One to Help Create Momentum and a Virtually Unshakable Foundation for Life! Day, So You Can Begin Formulating Strategies to Eliminate Them! AND Control You'll Ever Need with Food! 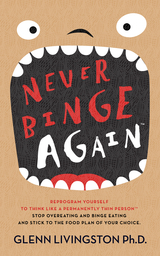 If you're reading this, you probably already know Never Binge Again is a rules-based program. YOUR rules! Hearing your Inner Pig Squealing (and then ignoring it) requires crystal clear lines which define what is vs. what is not on our food plans. Yet many people are terrified of these rules, particularly when they take the form of Never and/or Always. 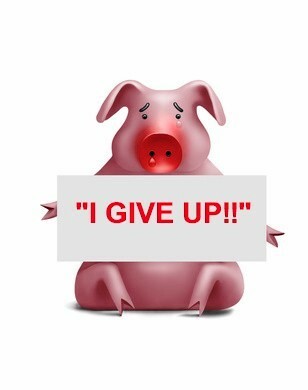 In this critical section we'll eradicate the fear of Never and Always by reviewing the most common objections and quickly showing them to be nothing but more of the Pig's deceptive Squeals. Even if you're already relatively comfortable with the idea of Never and Always rules, this section will significantly strengthen your foundation and make it possible to more thoroughly nail your Pig's Cage shut. Perhaps the most important distinction between people who succeed on Never Binge Again and those who's Pigs defeat them is the willingness and ability to get back up if you happen to fall. Plus, winners do all they can to LEARN from the experience so they can "stop the boomerang" and truly Cage their Pigs! 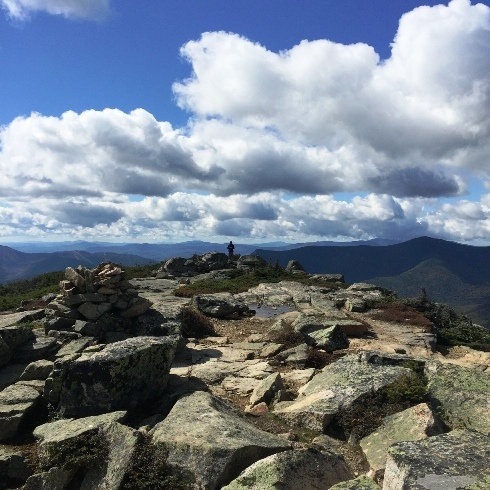 And how to get back on track after illness, injury, or ANY other interruption! How to Construct a Food Plan That Won't Drive You Over the Edge Like All Your Previous Diets, So You Can Achieve All Your Health Goals While Still Enjoying Food! For example, you'll discover the important reason so many people have trouble complying with a well-intentioned "eat when you're hungry and stop when you're full" rule. I'll show you how to fix the problem with an uncommon (but simple) shift of mind! This information is NOT in the book. This is the section where you learn to create a Food Plan which won't drive you over the edge like all your previous diets. We'll balance your health goals with personal freedom, avoid boxing you into a "food prison", and show you how to be sure your Food Rules don't cross the line into "Crazyville"
You'll also learn how to keep it simple! As long as your Food Plan is easy to remember, unambiguous, and nutritionally complete you CAN make it work. Evaluate your plan against these three key criteria for simplicity, then revise until it meets them 100%. You'll see how to balance taste vs. enjoyment with ALL your health goals, and I'll show you how to decide which foods to regulate vs. eliminate. Motivation for Even Your Most Tempting Times! One of the BEST ways to become sick and tired of your Pig's Squeals and maintain more permanent motivation to ignore them is to write down, amplify, and enhance your "Big Why" statement. Most people I've worked with can just barely articulate their motivation. In this module I'll help you thoroughly ground yourself in the REAL reasons you want to stop Bingeing. From then on, everything your Pig says will seem pathetic! How to Cage Your Pig Regardless of How Much Social Pressure and/or Family Conflict You Experience... No Matter How Much You Travel and/or Eat Out... and Despite How Little Free Time You May Have Available to Prepare and Plan Your Food! And even when the unexpected strikes! Why there's really no such thing as "self-medicating" with food, and how you SHOULD think of overeating in order to take back your control! How to Completely Eliminate Those "Sneaky Little" Binges and "Health Food" Binges Your Pig Says Are "No Big Deal"
Overcome the sneaky Squeal which says "You're really good at putting me back in my Cage now, so how much harm could I really do?" 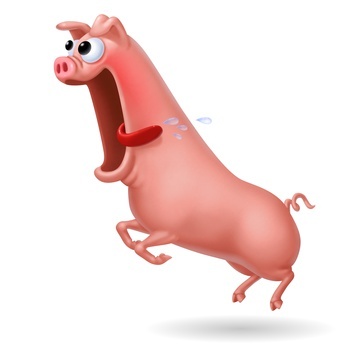 How Much It Squeals for You To Start "Tomorrow"
WARNING: "I know the answer...I only need to put it into practice"
What to do when your weight has reached a new high, and you REALLY know it's time to Cage the Pig! What if every time you fail you find it harder to re-start? Is that a good reason to put this off until you've got the PERFECT plan? 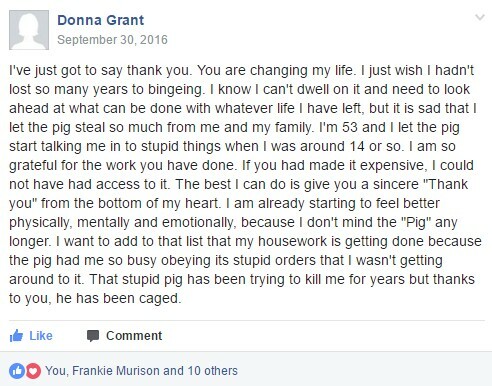 Here's something which might come as a surprise to many of you - it's entirely possible to Cage Your Pig indefinitely without losing weight. 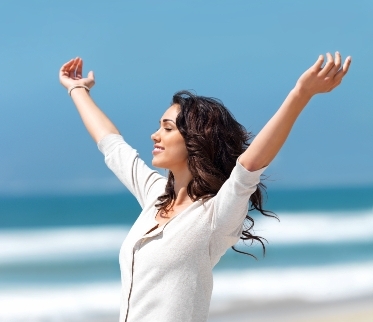 Yes, you'll gain immense benefits - freedom from the obsession, a healthier body, mind, and soul. But when it comes right down to it, many (if not most) of us want to take off somewhere between a mountain and a mole-hill of extra pounds we packed on during our years of overeating! 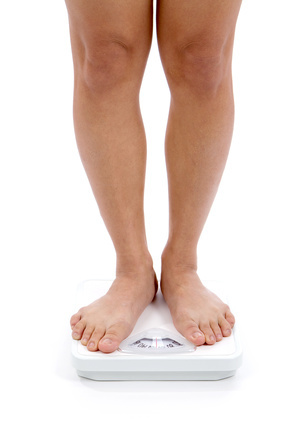 How to choose a weigh-in frequency - if you should choose one at all! SESSION FOUR PART B: POSITIVE THINKING - NEVER BINGE AGAIN STYLE! How to Use Never Binge Again to Eradicate Negative Thoughts, Achieve Your Goals, Maintain a Positive Attitude...and Thoroughly Enjoy Your Life! 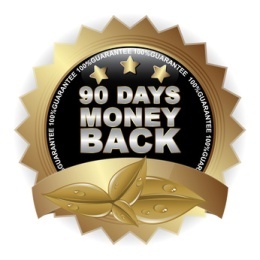 FREE BONUSES: Available nowhere else, these important trainings are immediately downloadable after you order the full program, and you may keep them even if you decide to ask for a refund. That's just my way of saying "Thanks for giving it a try!" Approximately one year after the book was published, I started to notice a pattern with my personal coaching clients. 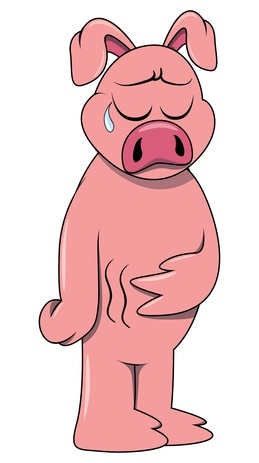 There was ONE Pig Squeal which didn't seem to yield to the Never Binge Again methodology for a significant number of people, with seemingly NO rhyme or reason. They'd apply the standard Never Binge Again approach, but when night time came, all bets were off. Their Pigs were like vampires, only coming out at night to feed! 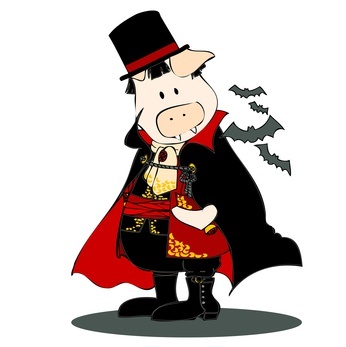 For months I just couldn't figure it out because I'd personally solved the "Pig Vampire" problem along with all my other overeating problems in the exact same way. What if you just "freak out and can't deal!?" This was a truly a piercing insight which made a dramatic difference for not only these clients, but the people who viewed the 45 minute recording I created based upon it. And this is the ONLY place you can get it! 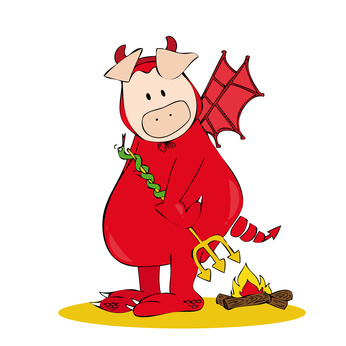 The horrific problem with the "I deserve it" Squeal... and how to stop it in its tracks! Why the solution for night time eating can work for WEEKEND eating too! Just like with the night time eating webinar, this is the ONLY place you can watch this important training. It takes a bit of practice, but once you employ it, eating a simple apple becomes a gastronomic experience like no other. In fact, you'll enjoy eating fruit and vegetables so much, you might actually wind up feeling guilty for it! It can work as an antidote for negative feeling and emotions too. While at the same time inoculating yourself against those negative thoughts and emotional patterns throughout the day. That’s why we’re adding FOUR bonus recordings on Mindfulness and Mindful Eating to the program. This is over and above the four Never Binge Again Online Intensive sessions. 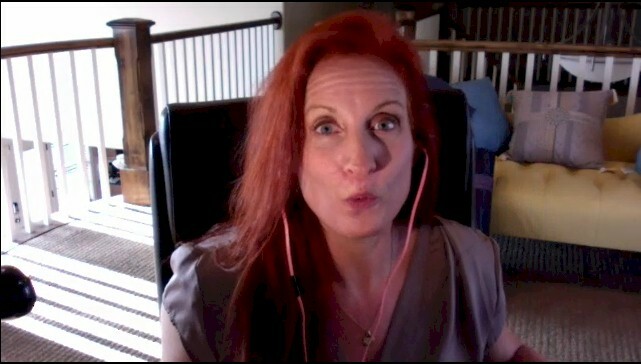 The mindful eating bonus recordings will be delivered week by week concurrent with the online intensive sessions. We are seriously considering separating these recordings out into a paid-for-separately product of its own. If you are reading this text then it IS available today and WILL be delivered along with your training if you purchase TODAY... but if you come back tomorrow and this text has disappeared, please understand we will no longer be able to offer it. WHERE: The Four Online Immersion Sessions are Held LIVE Online. Access the calls via your computer and a headset OR a simple telephone. Or download the recorded sessions within 48 hours and watch at your convenience if you need to miss a session. YOU CAN JOIN AT ANY TIME! Even though the LIVE groups and lectures begin at the particular dates and times above, you can always join right away, watch the last set of recordings, get your individual coach as soon as you've done that, and then STILL attend the LIVE lectures when they begin! The Unlimited Coaching Sessions (Gold Level) will take place from May 29th, 2019 through September 28th, 2019. Check your email immediately after booking for further details and logistics. CHANGE YOUR EATING - CHANGE YOUR LIFE! 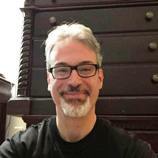 Immersing yourself with me and a group of fellow Never Binge Again enthusiasts LIVE for a full month, followed by four months of UNLIMITED INDIVIDUAL COACHING WITH ME, is one of the best ways I can think of to help you come to terms with the problem and face it square on...in a safe environment with my help and the comfort of others facing the same issues. We'll help you deal with outside challenges, get focused, stay focused, and learn to REALLY use that one "weird trick of mind" which has the potential to save your life. PLUS a Virtually Fail-Proof System to Help You Overcome Cravings, Lose All the Weight You Wanted, and Keep It Off WITHOUT Driving Yourself Crazy? 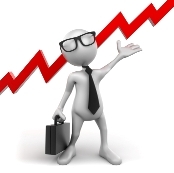 At this point you must be wondering what you'll need to invest to achieve all this. Well, if you seriously struggle with overeating, the amount you can save on food alone by getting the problem under control for even just a few months should exceed any reasonable price I could possibly charge. 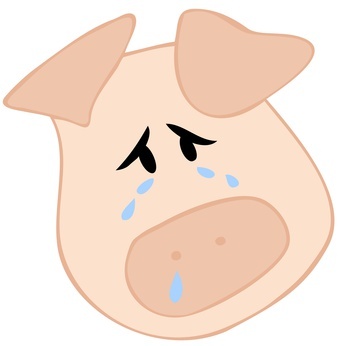 When I personally think about how much I've spent over the years on binge food I just want to cry! And the physical pain and personal tragedies you can avoid by eating healthier. Can you even put a price on that? ALSO NOTE: We reserve the right to raise the price without notice at any time. To maintain our ability to provide quality coaching, attendance is strictly limited to 50 people per level - see below for specifics. From the bottom of my heart to the bottom of yours... I know you can do this! Won't you let me help you? Make Never Binge Again Into More Than Just An "Aha Moment" -- It's Time To Make It Your Default Way Of Thinking! with Dr. Livingston Himself LIVE! Plus, Because I Want You to Feel 100% Confident in Your Ability to Stop Overeating This Program Comes with Not One, But TWO Full Money Back Guarantees! First, if you're not 100% convinced this online workshop will radically transform your relationship with food AND give you the confidence you came for by the end of the first session, just email and/or call my support team (or open a ticket) and let us know it's not for you. We'll promptly and cheerfully refund every penny you paid, no questions asked! Guarantee number two, which applies to the Gold Package of the Unlimited Coaching and Online Intensive Program (only), is designed to prevent your Inner Pig from weaseling out of things once you know this is for you. Here's how it works: Schedule and participate in at least two of the one-on-one coaching sessions. If you don't feel your eating has improved dramatically we will STILL refund your money anytime within 120 days of purchase. I can't be any fairer than that! Over This Eating Thing for Good? This coaching program is perfect for YOU if the book alone hasn't been enough to overcome your overeating, or if you're doing rather well with Never Binge Again and want help cementing your progress. You'll get a candid, blunt, and honest approach to losing weight and freeing yourself from the obsession with food for life. And remember: The first fifty people to order each package can get UNLIMITED INDIVIDUAL COACHING for four months following the month-long group coaching event. It's like flicking a switch in your brain and eliminating all the angst around dieting. Stop hating yourself, condemning yourself, and treating yourself with anger and viciousness. I'll show you how to talk to yourself in a gentle, non-judgmental way, and to make more mindful choices about food despite what outsiders SAY about my method! You'll also hear example after example of food rules that work. And I'll show you what to do if your Pig keeps "making you forget" your commitment because you're too busy. Reclaim the self you remember - the one that used to be filled with confidence and strength! Don't leave yourself at the mercy of food, or let yourself slip farther into the food addiction hole. Overcome feelings of powerlessness and hopelessness. Let's get this food thing fixed! It's not at all uncommon for people to say hearing JUST ONE THING from myself and/or a fellow Never Binge Again enthusiast was all it took to nail their Pig's cage shut. That one thing is different for everyone, and you're much more likely to hear it during a weekend immersion than anywhere else! Even if you've decided NOT to join me for this very special online month-long workshop (and UNLIMITED follow up coaching for four months) I hope you will do me the honor of giving yourself a peaceful rest of your day with food. It would mean the world to me. Really. If you've read the book and you know it can work for you, but you haven't fully implemented (or made the decision to do so) then this is for you. Getting INTO the intensive is the big decision you need to make, and you'll have the follow up individual coaching sessions to see it through!!! This is not just about weight loss. Many people report skin improvements, energy level changes, better relationships due to increased presence and less obsession with food, along with more mindfulness and enjoyment of life! It's also about getting more in tune with your hunger and satiety signals, lowering your grocery bills, etc. And about learning how to stop listening to the lie inside your head which says "I can't" or "I'm not ready" or "maybe this works for some people but not for me!" Get real-world, LIVE help to nail your "Inner Pig's" cage shut! Get past your fear of putting things on your "Never Eat Again" and "I Always Do This" lists - guaranteed! Form strong bonds (and make lifelong friends) as you immerse yourselves in the full experience. 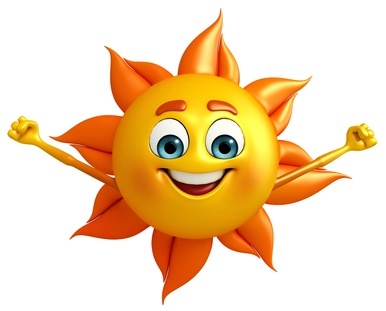 Connect with the energy of people eager to stop overeating...and willing to lend each other their hope and enthusiasm! End the vicious cycle and get out of "Food Hell." Get piercing insights into the see-saw, on-again, off-again pattern which characterizes most people's weight loss journey, and how to get on a more permanent track!